Performances are May 2-5. Showtimes to be announced. Tickets go on sale on April 1 and are available at Lothespians.weebly.com or through links on the high school’s homepage, lakeorionschools.org/high-school-home and district homepage, lakeorionschools.org. They’re creepy and they’re kooky, mysterious and…altogether a lot of deranged fun. “If you’re looking for the kooky and spooky Addams Family, come out and see our show,” said Jonathon Kind, director of the musical and drama teacher at the high school. While the musical takes place after the events of the 1960s television show, Kind assures audiences that they will see the ooky Addams Family that they know and love. “The biggest thing that’s similar, is we have a return of all of the characters that people love about The Addams Family. We’ve got Gomez and Morticia and their kooky relationship, crazy Uncle Fester, Wednesday, Pugsley, Grandma, Lurch, all of the family favorites,” Kind said. “But one of the biggest differences is that this is actually a love story. Wednesday falls in love with a normal guy and this is the story of them trying to reconcile the differences of the two families,” he said. The musical follows the Addams Family as they deal with Wednesday Addams, the family’s macabre princess of darkness, who has fallen in love with Lucas Beineke, and invites him and his parents, Mal and Alice, to dinner. Wednesday confides in her father and begs him not to tell her mother about her feelings. Gomez Addams must then do something he’s never done before – keep a secret from Morticia, his beloved wife. What will happen on the fateful night the Addams’ host a dinner party for Wednesday’s boyfriend and his parents? Senior Jason Donaven plays Gomez Addams, the riotous patriarch of the family, and senior Ginger Johnson plays Morticia Addams, his witchy wife. Olivia Kelly portrays Wednesday Addams, while freshman Brian Donoghue plays Lucas. Senior Amanda Pordon is Grandma and Junior Bodi Johnson plays Uncle Fester. “All of the students, even the ensemble (‘the Ancestors’) are having so much fun with what they are able to do with their characters. They’re really able to make them their own, and we’re seeing a lot of individuality come out of them…they’re getting a really enriching experience out of this production,” Kind said. Pordon says one theme of the musical audiences can relate to is acceptance of others. Donaven is a stage veteran of “around 10” shows at the high school and community productions and knows the spring musical always draws a big crowd. “This is a huge production. 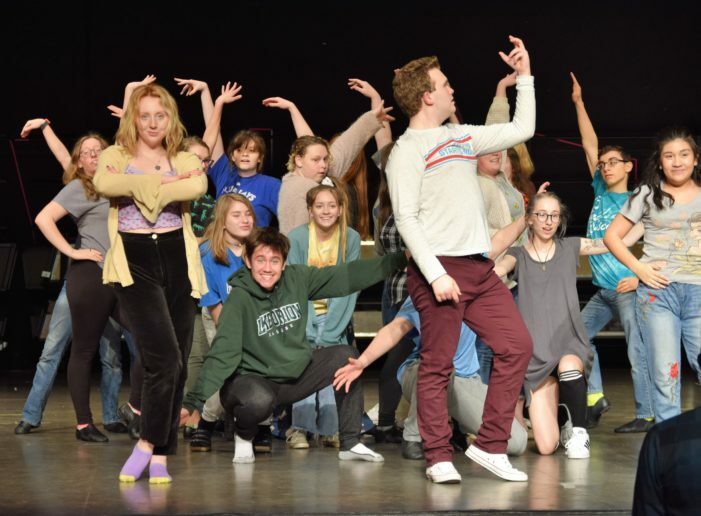 This is probably the production at the high school that most of the community comes out to and we’re really excited to see a bunch of people here on opening night,” Donaven said. “It’s just so much fun. You get to go and escape and laugh and just enjoy the characters. The bonding that I’ve gotten to do with this group of people and seeing myself and them grow as performers. And especially as comedians for this show, too, because it’s so different, very slapstick. It puts a smile on the audiences’ faces,” Donaven said. And while the showtimes are not until May, the sets are under construction, the cast knows the vocals for the songs and are about halfway through learning the choreography and three-quarters of the way to learning the blocking for the show. The musical features music and lyrics written by Andrew Lippa and is based on the book by Marshall Brickman and Rick Elice and the original characters created by Charles Addams. The original television show only lasted two seasons, from 1964-1966, but has spawned a cult following, with two theatrical films, a made-for-tv movie, a short-lived television series in the late 1990s and The Addams Family Musical.